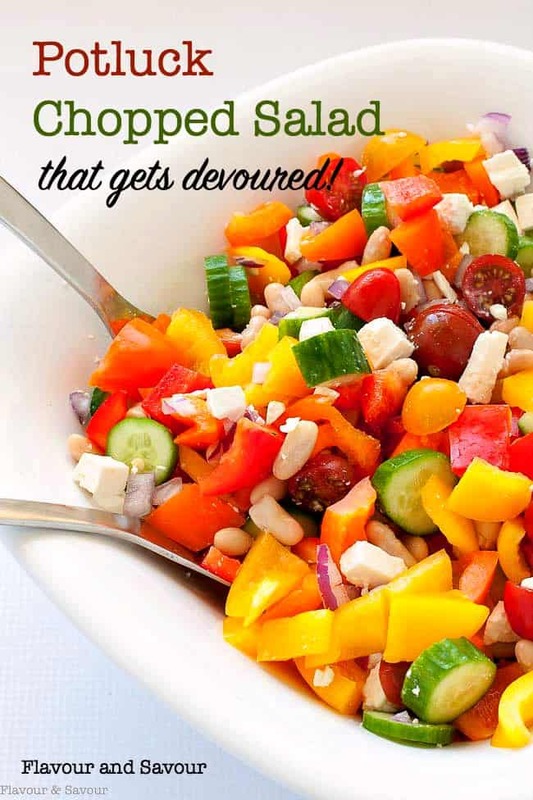 This Mediterranean Chopped Salad recipe is easy to adapt to your family’s tastes. It’s fresh, crisp and colourful and perfect for potlucks or family gatherings. 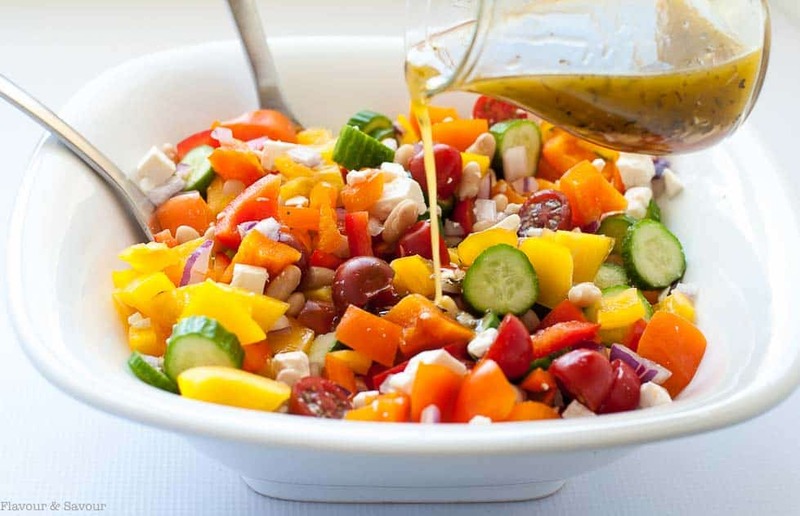 This recipe for Mediterranean Chopped Salad is a long-time favourite in our home. We love the colour, the crunch and the rich flavour of vegetables, garlic and herbs. 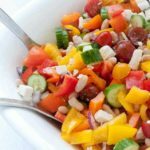 I make variations of this Greek-style salad throughout the year. 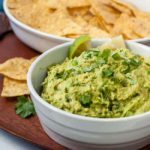 It’s a recipe that you can easily adapt to your liking. 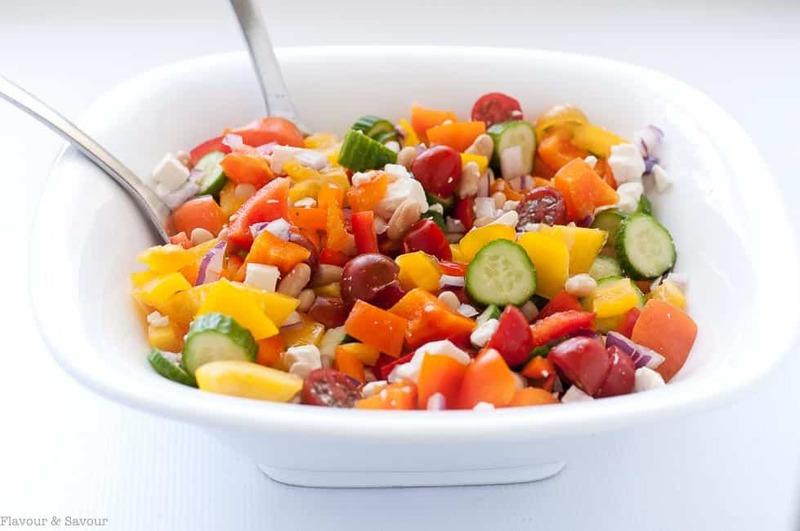 Start with the basics: cucumbers, peppers, tomatoes, and red onion, then customize it to your family’s tastes. I added cannellini beans, but you could substitute chickpeas or cooked quinoa as I did in this Garden Fresh Mediterranean Quinoa Salad. Keep it Greek by adding Kalamata olives, (or omit them if you have olive-haters in your group!) 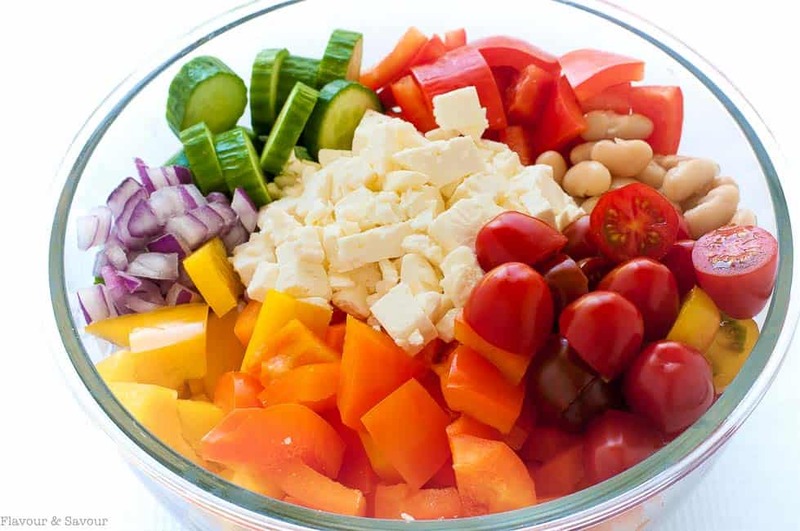 Top those beautiful colours with crumbled feta cheese or goat cheese and transfer to a serving bowl or platter. Toss those colourful veggies and protein-rich beans with a simple Greek dressing made with olive oil, red wine vinegar, lemon, garlic and herbs and enjoy! This Mediterranean Chopped Salad is an ideal choice for a potluck. 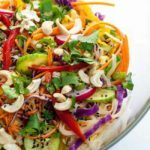 Here’s a salad that won’t get passed over! It’s also great for a picnic. We took it camping recently and munched away in the sunshine on the beach. With no lettuce or greens to turn limp or slimy, this salad stayed fresh, crisp and crunchy. I hope this becomes one of your “go-to” recipes, too. 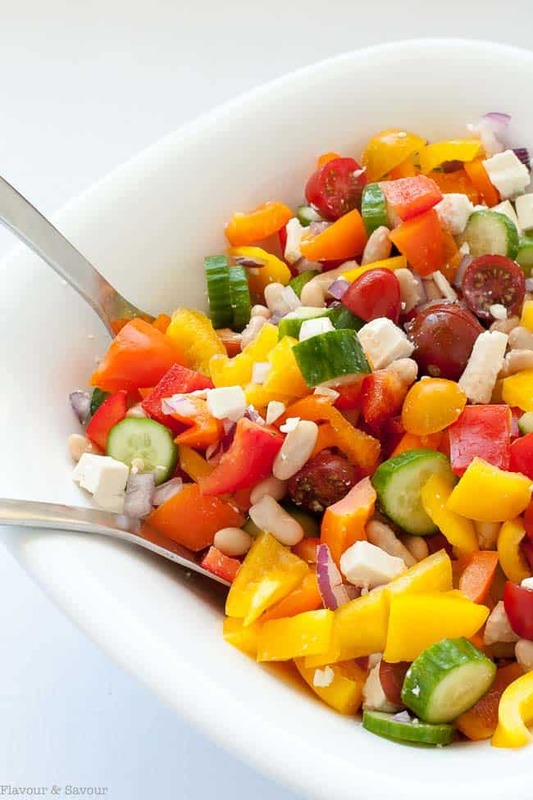 This Mediterranean Chopped Salad recipe is easy to adapt to your family's tastes. Fresh, crisp and colourful and perfect for potlucks or family gatherings. Whisk dressing ingredients together and let stand while preparing salad ingredients. 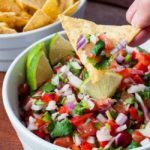 Combine all ingredients in a large bowl and toss with dressing. (You may have extra left over.) Refrigerate until serving time. You may only need half the vinaigrette for this salad, so save the remainder for another salad or use as a marinade for chicken. Calorie calculations were based on using half the amount of vinaigrette. Thanks! It seems like we often do just that!! Such a gorgeous looking salad! I love all the flavors and textures here! Thanks, Amy! We eat with our eyes first, and this salad is always appetizing! 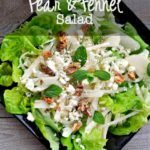 Love your photos, this looks like a perfect salad to make for lunches! Well I like how you eat when you go camping, this is the best camp food ever. It looks amazing! wonderful looking salad! love all the flavors here.